IAR's EWARM is a J-Link compatible 3rd party IDE that supports most J-Link features out-of-the-box. We recommend to always install the latest J-Link software and documentation pack to make sure that EWARM uses the latest J-Link DLL. 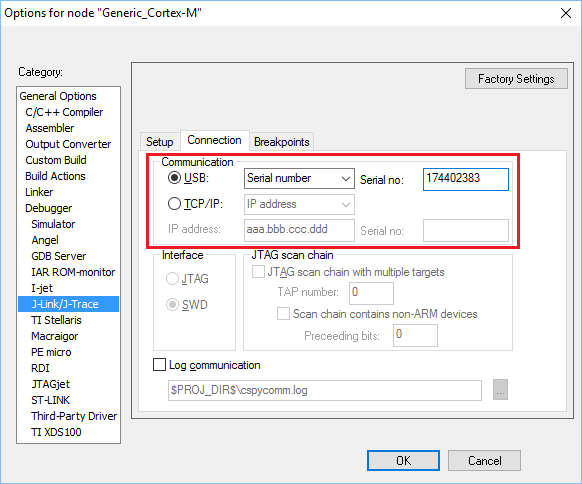 In the following, it is explained how to configure a project to be used with J-Link. If the target device used is not listed in EWARM, either a IAR device description file (.ddf) or the IDE independent way can be used. For further information regarding .ddf files, please refer to the IAR documentation. IAR EWARM does not provide any native support for J-Link script files so usage of them cannot be configured from within the GUI of the IDE itself. Rename the J-Link script to <ProjectName>_<DebugConfig>.JLinkScript. In the sample below, Start_STM32F103_MB672_Debug.JLinkScript would be correct. The settings file is created in a "settings" subdirectory where the project file is located. NOTE: Since IAR EWARM V5.30 J-Link is fully and natively supported by EWARM, so RDI is no longer needed. In order to use J-Link RDI, the debug driver needs to be changed. Now an extra menu, RDI, has been added to the menu bar. Choose Configure in the RDI menu to configure J-Link RDI. For more information about the setup of J-Link RDI, please refer to UM08001. It is possible to configure the IAR EWARM compiler so that stdout is redirected to SWO. 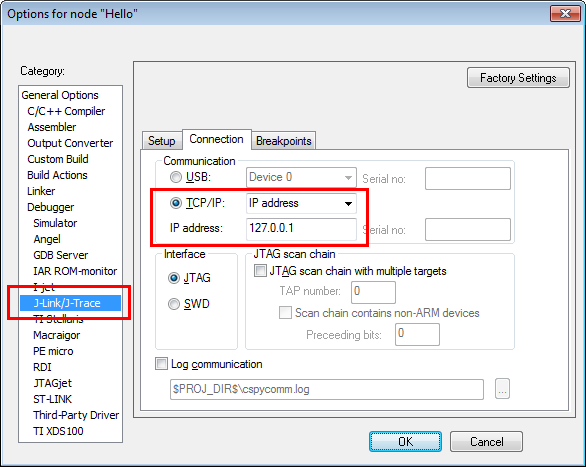 If multiple J-Links are connected to the host PC and/or a J-Link connection via TCP/IP shall be used, either the IDE independent way can be used, or the S/N or IP of the respective J-Link can be specified in the IAR EWARM project settings. 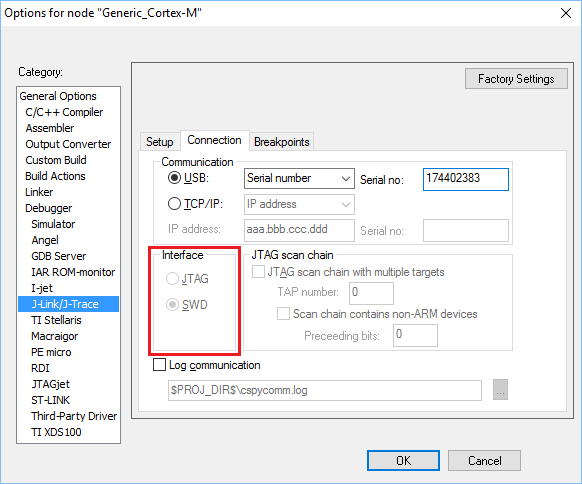 The J-Link Remote Server makes it possible for IAR Embedded Workbench IDE to connect to a J-Link remotely, without needing a physical connection to the J-Link. With EWARM release version 8 some default project settings for SWO configuration with J-Link got changed and thus manual correction by the user is currently necessary. The following article will show a step by step guide how to set up SWO in an EWARM project and common troubleshooting tips to solve any issues a user might run into. 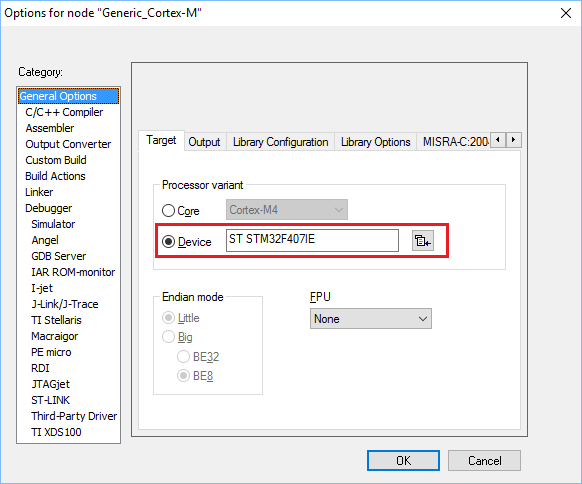 Open up an EWARMv8 project and make sure the correct target device is selected (in case of the emPower board it is the NXP MK66FN2M0xxx18). 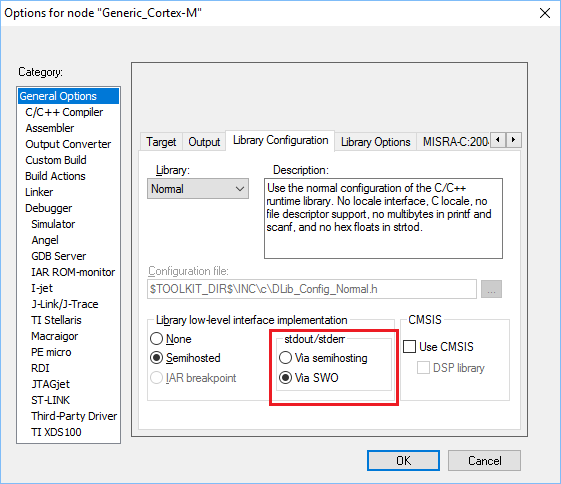 Next change the project settings to use SWO instead of Semihosting (If SWO is greyed out, go to J-Link/J-Trace -> Interface and select SWD as interface). Make sure J-Link/J-Trace is selected as debug hardware. Now start the debug session and open the Terminal I/O window under View-> Terminal I/O, the printf output will now be displayed in that window. The Terminal I/O windows is still not showing any information even after following the setup guide step by step. Create a testloop in your application where repeatedly prinf is called and see if that message is displayed in the J-Link SWO Viewer, if this is the case then the EWARM project settings are still incorrect. I want SWO to output PC and timestamps. 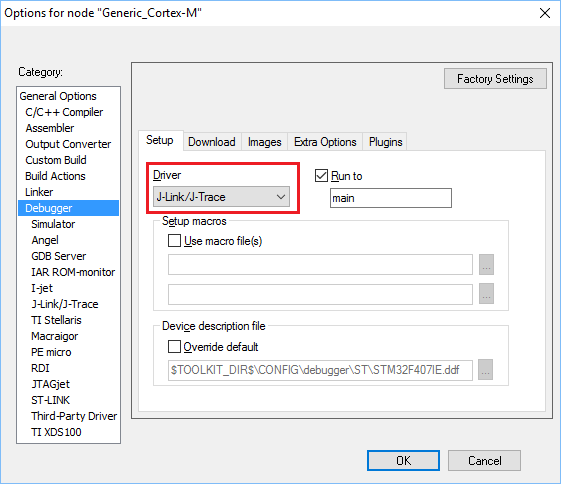 To do so you need a running debug session, now go to J-Link->SWO Trace, press the "On" button in the now open window, then go to J-Link->SWO Trace Window Settings... and select all advance SWO features you want to monitor in the SWO Trace window. I am getting OVERFLOW packages, what should i do? 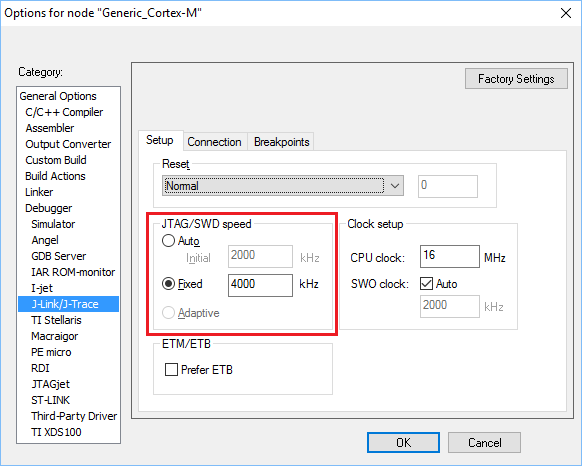 When outputting large amounts of SWO trace data the SWO clock must be increased as well so the target device is able to output all generated SWO data. In addition to this a capable debug probe is needed. A J-Link model overview can be found here: J-Link Model Overview. For the best SWO trace experience we recommend a J-Link ULTRA+ or higher. 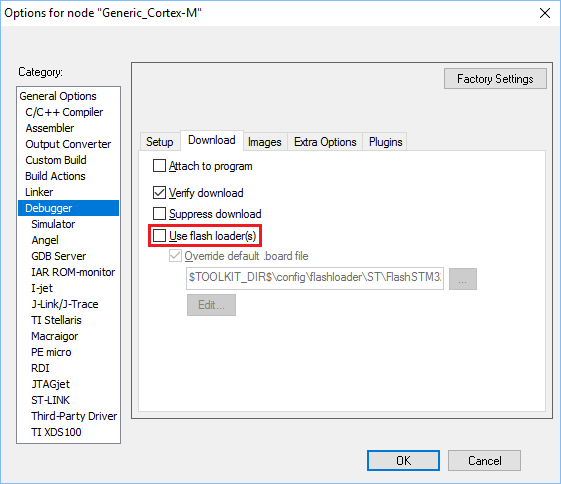 Try to use the J-Link flash loader to program the target device instead. To do that simply uncheck the following option in project settings.